Am Indoor Meeting in Norman, Oklahoma testete ich meine "Sprint-Fähigkeiten" mit einem Doppelstart auf den kürzeren Distanzen. 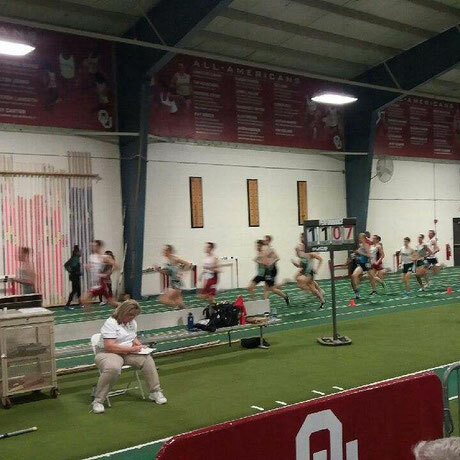 After a good week of training we went to Norman, Oklahoma, where I did a speed test at the J.D. Martin Invitational. I was really excited for this opportunity since I never ran this fast in practice the last few months..
My first race was a Mile, which was exactly eight laps on the 440 yards track. My team mate went out in perfect pace and I was able to follow right in third position. I focused on staying relaxed while it felt like I was sprinting the whole way. During the next few laps, I worked my way up to second position and with 600m to go I decide to make my move. I went into the lead and stayed there for just one lap. There, Troy Taylor my former team mate, flew passed my like I was standing still. I tried to react but all I could give was a 64 seconds for the last two laps. In the last 150m, I lost two more positions and finished in fourth position. The finishing time of 4:17.16 is more or less equal to my performance from last year at the same meet. Instead of last year, my racing day was not over yet. I had 80 minutes to get ready to race again. I spent this time with some easy laps around the football field, some stretching and shortly after, I already had to tie my spikes again. In the 1000m-Race, there were just three other guys on the starting line and all of them were from North Texas. Two of them raced already the mile with me and then there was our 800m-specialist who didn't race yet. He was ready to make us suffer from the first step and went out in 27 seconds for the first lap. I followed in third position already with a gap to close. I went through the 600m in new PR-time (Yes, it is pretty long ago since I raced this distance the last time). With two laps to go, I had to pay for the fast pace in the beginning. I closed the race even slower than the previous mile and finished in third position with not really glorious 2:34.00. This two races were definitely a good training and I really enjoyed to finally run faster again. To run so fast on a flat track is every time a challenge especially if you have to compete with 15 other guys like I had to in the mile. Now, I will have 13 more days until our first championship race of 2018, where I will compete over 5000m and 3000m.